About the time I was asked to write the introduction to The Best of Girl some months ago, a few odd things converged. David Roach -- artist and general all-round comics' expert -- had sent me a pile of notes on Girl only a matter of weeks earlier and I'd been pondering (posh version of me going "huh?" and "You what?") over one of the credits he'd included. The scripts for 'Wendy and Jinx' -- the two inseparable chums of Manor School whose adventures graced the covers of Girl for a while -- were credited to Michael Hastings when the story first appeared in March 1952 and, after a few months, to Valerie Hastings. Could Valerie be the pseudonym of Michael, I wondered? 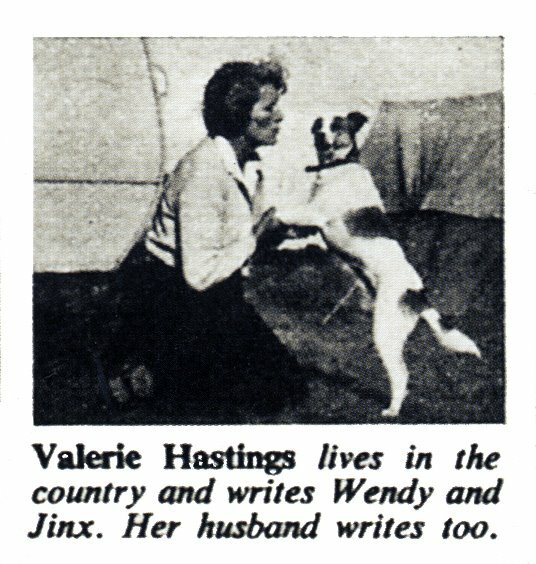 Soon after, I stumbled across a small picture of Valerie Hastings in the first anniversary issue of Girl which revealed that she "lives in the country and writes Wendy and Jinx. Her husband writes too." Not much to go on, but it now looked like Michael and Valerie Hastings were husband and wife. Valerie had only a few books to her credit, starting with Wendy and Jinx and the Dutch Stamp Mystery, published as one of the 'Girl Novels' series by Hulton Press in 1956, followed a year later by a second. According to The Encyclopedia of Girls' School Stories "Both books combine a thriller-style main plot (jewel thieves in Dutch Stamp Mystery, Iron Curtain escapees and fraud in Missing Scientist) with a sub-plot set in school." Valerie Hastings wrote two other series, one featuring a character named Jo, the other starring Jill of Hazelmere School. Her last book appears to be Flood Tide, published by Harrap in 1967. Michael Hastings, on the other hand, had at least 30 novels published, the last in 1980. Most were fast-moving action thrillers set in colourful locations: The Rising Sea (1962) is set on a South Seas island threatened by a tsunami and Death Across the Tamagash (1965) begins in a South American state wracked with revolution and counter revolution. You can get the feel of his novels from the titles alone: Death in Deep Green, The Coast of No Return, The Rising Sea, Dangerous Oasis, The Castle of Vengeance, Killer Road, etc. "An adventure novelist and short story writer, Hastings was born in the Midlands but eventually settled on the South Coast after a spell in London. He served with the R.A.F. in the Middle East during the Second World War. Hastings travelled widely and drew on these experiences for backgrounds to his stories.With the help of John Herrington, another researcher of long-lost authors, I've managed to put together a few additional notes." Michael Roy Hastings was born c.1907 and was living at St Leonards-on-Sea in the 1950s with his wife Valerie (b. 14 February 1902). According to a brief news report in the Hastings Observer (10 October 1959) which noted the publication of his sixth novel, "Mr. Hastings is also a writer of thrillers, but these are published under a pseudonym." Huh? Unfortunately, we've yet to figure out what that pseudonym was. However, we do know that Hastings remained in St Leonards-on-Sea until the 1970s when he moved to nearby Bexhill-on-Sea where Valerie Hastings died in the autumn of 1975, aged 73. Michael Hastings continued to write until he also died, in 1980. There are still a number of mysteries unresolved. There are at least two other authors named Michael Hastings (one born in 1938, another in 1958) and the three authors' works are sometimes credited to each other. 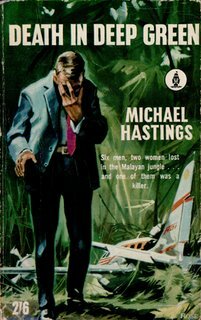 However, there was one earlier thriller novel, They Killed a Spy (London, G. G. Harrap & Co., 1940) that might be by Michael Roy Hastings, twelve years before his next novel appeared. 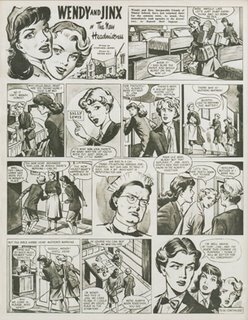 I'm also wondering whether Hastings might not have been the author of the first Girl cover strip, 'Kitty Hawke', who piloted a Tadcaster for her father, head of 'Hawke Air Charter, with an all-girl crew. I've never been able to find out who wrote these stories but Hastings is a possible suspect given his R.A.F. background and fondness of exotic locations for thrillers. Perhaps he was then asked to write a replacement strip and created Wendy and Jinx, later passing the scriptwriting chores on to his wife. Pure speculation, of course, but not an outrageous idea. After all, if artist Ray Bailey could switch from Kitty to Wendy and Jinx why not the author? But while I'm speculating, could the thriller pseudonym used by Hastings be Gabriel Hythe? Hythe is credited with three books from Macdonalds (Hastings' publisher), the first appearing in 1959 (same year as the newspaper report mentioned above); all three books were set in England, unlike Hastings' other novels (perhaps prompting the use of a pen-name) and Hythe, like Hastings, is the name of a town on the English south coast. Hythe is also credited with some stories in Argosy in 1967-69 and Hastings was contributing around the same time (1966-73); Hythe also contributed to the Evening News where both 'Hythe' and Hastings were appearing regularly until 1973, then had a five-year break before returning for one last story apiece in June 1978. Coincidence? I think not! One of the mysteries surrounding Michael Roy Hastings was that there was no record of his birth. If he had been born outside the U.K. that would have been understandable, but to be born in the Midlands and have no birth record would have been... not impossible, as even official records are misplaced and otherwise mucked up on occasion, but odd. We had quite a lot of fun trying to figure out whether Hastings was actually his real name or not. As it turns out, it was not the name he was born with. Jacqueline's interest was concerned with her mother, Barbara. Born in Weymouth in 1916, Barbara Board had become one of the few female journalists working as a correspondent for British newspapers in the 1930s. Her experiences were revealed in two books, Newsgirl in Palestine (London, Michael Joseph, 1937) and Newsgirl in Egypt (London, Michael Joseph, 1938). In 1940, she was living at the Belgrave Hotel in Holborn, London, at the same address as author Michael Roy Hastings. The two were married on 28 March 1940 so that Barbara could accompany her now husband when he was posted by the R.A.F. to the Middle East. Michael gave his occupation as 'author' on the marriage certificate which would seem to confirm that he is likely to have been the writer of the thriller They Killed a Spy (1940). The marriage certificate was quite revealing as it gave the name of Hastings' father as Herbert William Higgins, a deceased accountant. Further digging has shown that Herbert Higgins was an accountant's clerk living in Birmingham in 1901, who had married Caroline Augusta Hart in 1899. Michael and Barbara Hastings had only a brief marriage but I shall leave that story to Jacqueline to tell as she has been editing two unpublished manuscripts written by her mother for publication in January 2008 under the title Reporting From Palestine. Jacqueline is herself a poet and essayist and more information about the upcoming book and Jacqueline's own publications can be found on her website. You can pre-order Reporting From Palestine from amazon.co.uk. Not all the mysteries surrounding Michael Hastings have been resolved. What was his birth name and why did he change his name from Higgins? Why can I find no record of his (second) marriage to Valerie Hastings despite an extensive search? His use of the pen-name Gabriel Hythe has since been accepted as being 99% certain -- that annoying and elusive 1% awaiting some kind of official confirmation from payment records or some other source. No doubt there will be more digging in future months. John Herrington has been able to resolve one of the outstanding queries: Michael Hastings was born Herbert Roy Higgins on 19 October 1907, his birth certificate confirming that he was the son of accountant's clerk Herbert W. Higgins (d. 1922, aged 50) and his wife Caroline A. Higgins (d. 1948) who lived at 711 Earlsbury Gardens, Handsworth, Staffordshire. Michael Hastings: the author that just keeps giving! Unbelievably, a completely separate enquiry has turned up some new and unexpected information on Hastings, a.k.a. Herbert Roy Higgins. John Herrington (see above) posted a question about Alroy West, a pseudonymous writer of the 1930s, who had an entry in the 1935-36 Author's and Writer's Who's Who which gave an address in West Kirby, Cheshire. West wrote a series of thrillers for Wright & Brown between 1933 and 1937 before disappearing from the face of the earth. As nobody seemed to have anything in the way of info., John checked out the address using the old electoral roles for West Kirby. Lo and behold, the person living at that address was... Herbert Roy Higgins! The data for "Alroy West" included in Author's and Writer's mentioned that he was born in Handsworth, Staffs, which certainly ties in with what we know, and that he was educated at Bishop Vesey's, Sutton Coldfield. A check with the school confirms that Herbert was a pupil between 1 May 1919 and 1 December 1922. He is said to have been a writer on Egyptology and Eastern literature and a contributor to the Liverpool Weekly Post. He listed his interests as rowing, horse riding and chess. John has also confirmed that the Michael Hastings who wrote the 1940 thriller They Killed a Spy is indeed "our" Michael Hastings, the link confirmed via correspondence he had with the agents A. P. Watts (via their archive which is held by the University of North Carolina). We're creeping closer to having a better picture of Michael Hastings' output now. You have to wonder what will turn up in the future. They Killed a Spy. London, G. G. Harrrap & Co., 1940. Death in Deep Green. London, Methuen, 1952. The Coast of No Return. London, Methuen, 1953. The Digger of the Pit. London, Methuen, 1955. The Man Who Came Back. London, Macdonald, 1957. Twelve on Endurance. London, Macdonald, 1958. An Hour-Glass to Eternity. London, Macdonald,1959. The Voyage of the San Marcos. London, Macdonald, 1960. The Citadel of Bats. London, Macdonald & Co., 1962. The Rising Sea. London, Macdonald & Co., 1962. The Port of Lost Cargoes. London, Macdonald & Co., 1963. The Sands of Khali. London, Macdonald & Co., 1964. Death Across the Tamagash. London, Macdonald & Co., 1965.
? Jim Blake, Archaeologist. London, Parrish, 1965. The Green Silence. London, Macdonald & Co., 1966. The Snake and the Arrow. London, Macdonald & Co., 1967. Dangerous Oasis. London, Macdonald & Co., 1968. The Killing in Black and White. London, Macdonald & Co., 1969. Fire Mountain. London, Macdonald & Co., 1970. The Castle of Vengeance. London, Macdonald & Co., 1971. Killer Road. London, Macdonald & Co., 1972. Tiger Reef. London, Macdonald & Co., 1973. Dragon Island. London, Macdonald & Jane's, 1974. Desert Convoy. London, Macdonald & Jane's, 1975. River of Fate. London, Macdonad & Jane's, 1976. The Trader of Skull Island. London, Macdonald & Jane's, 1977. Satan's Bay. London, Macdonald & Jane's, 1978. The Puma Quest. London, Macdonald & Jane's, 1979. Veiled Isis. London, Macdonald & Jane's, 1980. Death of a Puppet. London, Macdonald & Co., 1959; as by Michael Hastings, Skipton, N. Yorkshire, Dales Large Print, 2000. Death of a Goblin. London, Macdonald & Co., 1960. Death of a Scapegoat. London, Macdonald & Co., 1961. The Crouching Men. London, Wright & Brown, 1933. The Baying Hound. London, Wright & Brown, 1934. Hate Island. London, Wright & Brown, 1934. The Knife Terror. London, Wright & Brown, 1934. The Man Who Didn’t Exist. London, Wright & Brown, 1935. The Messengers of Death. London, Wright & Brown, 1935. Stratosphere Express. London, Wright & Brown, 1936; abridged, Dublin, Mellifont Press, 1937. The Beach of Skulls. London, Wright & Brown, 1937. The Black Matador. London, Wright & Brown, 1937; abridged, Dublin, Mellifont Press, 1939. I love these detective hunts, despite having never read a 'Wendy & Jinx' or any of Hastings novels, they always make fascinating reading.